Art – Ms. Isoline and her students just finished up Square One Art! Look for your items with your little one’s art on it soon! 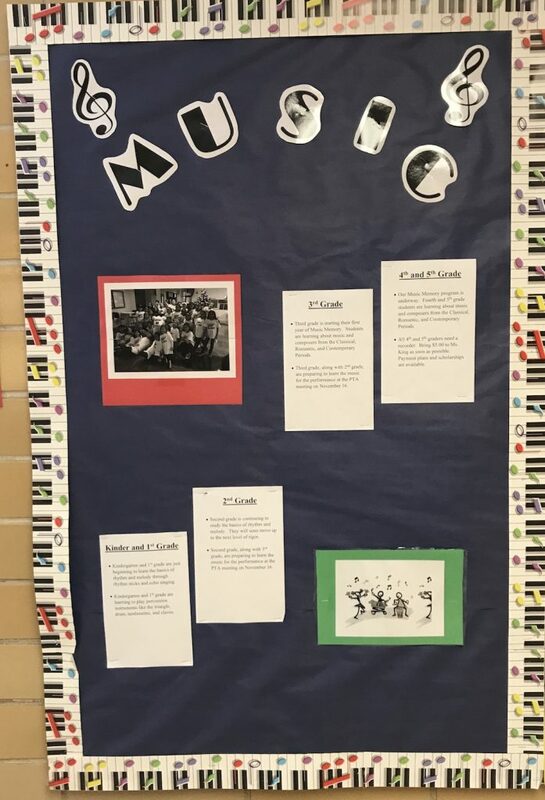 PE – Ms. Collins is getting the school in shape! Marathon Kids and C.A.T.C.H. are underway! Music – Mrs. King has the older grades learning Music Memory and recorder and the younger grades learning to sing and play instruments! The next performance (2nd and 3rd grade) is November 16 after the PTA meeting! Library – Mrs. Underwood just wrapped up the Used Book Fair! It was a great success, raising a lot of money to buy new books!